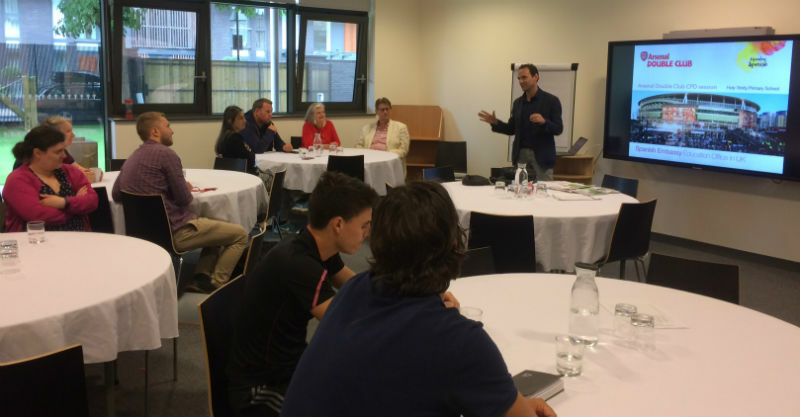 Arsenal Double Club, with the support of Cultural Partners, is offering Continuous Professional Development (CPD) to primary and secondary teachers. In light of reform to the National Curriculum, the interdisciplinary approach combining language learning and football skills offers teachers and learners a fresh perspective on language pedagogy. Each CPD programme will involve a presentation of Double Club materials, a demonstration of how to use the resources effectively and a practical training session, where teachers will participate in football-related skills and learn coaching techniques through active use of the language (and the ball) on the football pitch. The two-hour long training session will prepare teachers to use the materials directly in their language lessons and in their PE classes back in school. Keep an eye on our Twitter page to find out when future CPD sessions will take place.